For the arena formerly known as Oakland–Alameda County Coliseum Arena, see Oracle Arena. The Oakland–Alameda County Coliseum, typically known as the Oakland Coliseum for short, is a multi-purpose stadium in Oakland, California, United States, which is home to both the Oakland Athletics of Major League Baseball (MLB) and the Oakland Raiders of the National Football League (NFL). It opened in 1966 and is the only remaining stadium in the United States that is shared by professional football and baseball teams. The Coliseum was also home to some games of the San Jose Earthquakes of Major League Soccer in 2008–2009 and hosted games at the 2009 CONCACAF Gold Cup. The Coliseum has 6,300 club seats, 2,700 of which are available for Athletics games, 143 luxury suites, 125 of which are available for Athletics games, and a variable seating capacity of 35,067 for baseball, 56,057 for football and 63,132 for soccer. In seating capacity, Oakland Coliseum is the smallest NFL stadium, and the 2nd smallest MLB stadium. The Oakland–Alameda County Coliseum complex consists of the stadium and the neighboring Oracle Arena. The Coliseum features an underground design where the playing surface is actually below ground level (21 feet/6 meters below sea level). Consequently, fans entering the stadium find themselves walking on to the main concourse of the stadium at the top of the first level of seats. This, combined with the hill that was built around the stadium to create the upper concourse, means that only the third deck is visible from outside the park. This gives the Coliseum the illusion of being a short stadium from the outside. In its baseball configuration, the Coliseum has the most foul territory of any major league ballpark in Major League Baseball. Thus, many balls that would reach the seats in other ballparks can be caught for outs at the Coliseum. The distance to the backstop was initially 90 feet (27 m), but was reduced to 60 feet (18 m) in 1969. From 1968 through 1981 and in 1995, two football configurations were used at the stadium. During Raider preseason games and all regular season games played while the baseball season was still going on, the field was set up from home plate to center field (east/west). Seats that were down the foul lines for baseball games became the sideline seats for football games, which started up to 120 feet away from the field (most football-only stadiums have sideline seats that start around 60 feet away). Once the A's season ended, the orientation was switched to north/south: i.e. the football field ran from the left field line to the right field line; seats were moved from behind first and third base to create corners for the end zone to fit into (these seats were then placed to fill in the space that was normally behind home plate and near the foul poles for baseball games). Temporary football bleachers were then added in front of the baseball bleachers to form the sideline on the east (visitors') side, and the baseball bleachers were not sold. Raiders season ticket holders would thus have two season ticket locations in different parts of the stadium that roughly corresponded to the same location in relation to the field. Since stadium expansion in 1996, the field has run north/south throughout the season. Business and political leaders in Oakland had long been in competition with neighbor San Francisco, as well as other cities in the West, and worked for Oakland and its suburbs (the greater East Bay) to be recognized nationally as a viable metropolitan area with its own identity and reputation, distinct and separate from that of San Francisco. Professional sports was seen as a primary way for the East Bay to gain such recognition. As a result, the desire for a major-league caliber stadium in the city of Oakland intensified during the 1950s and 1960s. By 1960, a non-profit corporation was formed to oversee the financing and development of the facility (rather than city or county government issuing taxpayer-backed bonds for construction). Local real estate developer Robert T. Nahas headed this group (which included other prominent East Bay business leaders such as former US Senator William Knowland and Edgar F. Kaiser), which later became the governing board of the Coliseum upon completion. It was Nahas' idea that the Coliseum be privately financed with ownership transferring to the city and county upon retirement of the construction financing. Robert T. Nahas served 20 years as President of the Oakland–Alameda County Coliseum Board. On the death of Nahas, the San Francisco Chronicle's Rick DelVecchio quoted Jack Maltester, a former San Leandro mayor and Coliseum board member, "If not for Bob Nahas, there would be no Coliseum, it's really that simple." Nahas had to be a diplomat dealing with the egos of Raiders owner Al Davis, Athletics owner Charles O. Finley, and Warriors owner Franklin Mieuli. Preliminary architectural plans were unveiled in November 1960, and the following month a site was chosen west of the Elmhurst district of East Oakland alongside the then-recently completed Nimitz Freeway. A downtown site adjacent to Lake Merritt and the Oakland Auditorium (which itself, many years later, would be renamed the Henry J. Kaiser Convention Center) was also originally considered. The Port of Oakland played a key role in the East Oakland site selection; The Port swapped 157 acres (64 ha) at the head of San Leandro Bay to the East Bay Regional Park District, in exchange for 105 acres (42 ha) of park land across the freeway, which the Port in turn donated to the City of Oakland as the site for the Coliseum sports complex. The Oakland Raiders of the American Football League moved to Frank Youell Field, a makeshift stadium near downtown Oakland, in 1962, and the Coliseum was already being heralded in the local media as the Raiders' future permanent home. Baseball was also a major factor in the planning of the Coliseum. As early as 1961, the American League publicly indicated that it wished to include Oakland in its West Coast expansion plans. In 1963, American League president Joe Cronin suggested that Coliseum officials model some aspects of the new ballpark after then-new Dodger Stadium, which impressed him, though these expansion plans seemed to fade by the middle of the decade. In 1965, it was rumored that the Cleveland Indians might leave Cleveland for a West Coast city (such as Oakland), but the Indians ended up remaining in Cleveland. Charlie Finley, owner of the Kansas City A's, unhappy in Kansas City, impressed by Oakland's new stadium and personally convinced to consider Oakland by Nahas, eventually got permission after several unsuccessful attempts and amid considerable controversy, to relocate his American League franchise to the stadium for the 1968 season (for details on the controversy, see the separate articles for the A's and the Kansas City Royals, the expansion franchise created to replace the A's in Kansas City). The Raiders played their first game at the stadium on September 18, 1966. In 1968, the Kansas City Athletics moved to Oakland and began play at the stadium. The Athletics' first game was played on April 17, 1968. The stadium complex cost $25.5 million to build and rests on 120 acres (49 ha) of land. On April 17, 1968, Boog Powell hit the first major league home run in the history of the Coliseum. On May 8 of that year, Catfish Hunter pitched the ninth perfect game in Major League history at the Coliseum. The Coliseum hosted the 1967 and 1969 AFL championship games. From 1970 to 1972 the stadium hosted 3 college football benefit games featuring Bay Area schools versus historically black colleges. The Coliseum hosted the 1971 East–West Shrine Game on January 2, 1971. In 1972, the Athletics won their first of 3 straight World Series championships and their first since their years in Philadelphia. Commencing in 1973, the stadium hosted an annual Day on the Green concert series, presented by Bill Graham and his company Bill Graham Presents, which continued on into the early 1990s. Marvin Gaye made his official return to live performing and touring at the Coliseum on January 4, 1974 and the Coliseum was the basis for his 1 million-selling live album, Marvin Gaye Live! At the time, music industry executives cited the tour as a "heralded event" as Gaye made a comeback to live touring nearly 4 years after the death of his late singing partner Tammi Terrell. Led Zeppelin played what turned out to be their final North American concerts with twin shows during their 1977 North American Tour. After their first show on July 23, members of Led Zeppelin's entourage were arrested after a member of promoter Bill Graham's staff was physically assaulted during the performance. Parliament-Funkadelic recorded half the album Live: P-Funk Earth Tour at the Oakland Coliseum in January 1977. The album was released in April of that year. The awkwardness of the baseball-football conversion, as well as the low seating capacity (around 54,000 for football) and that the prime seating on the east side consisted of temporary bleachers led the Raiders to explore other stadium options. One such option was Memorial Stadium on the UC Berkeley campus. Several preseason games were played there in the early 1970s along with one regular season game in 1973 (a 12-7 victory over the Miami Dolphins during September while the A's regular season was going on). However, in response to traffic and parking issues associated with these games (while Cal games drew a large number of students who live on or near campus and walk to the games, Raiders games attracted fans from a larger geographic area who were used to tailgating at the Coliseum and were more likely to drive to games), the City of Berkeley passed a Professional Sports Events License Tax in which the city collected 10% of all gate receipts, making the staging of professional games inside the city cost-prohibitive. The Raiders were granted an injunction from the city collecting the tax, arguing that the tax was a regulatory measure rather than a revenue measure, and was therefore an improper regulation on land held in trust by the Regents of the University of California. However, the grant of the injunction was reversed by the California Court of Appeals, who found it to be a revenue measure, despite the fact that the city had made the measure immediately effective "due to danger to the public peace, health, and safety of the City of Berkeley as a result of the holding of professional sports events there". The stadium was not well maintained for most of the late 1970s. Its condition was most noticeable during baseball season, when crowds for A's games twice numbered fewer than 1,000. On April 17, 1979, only 653 fans attended the game versus the Seattle Mariners. During this time, it was popularly known as the "Oakland Mausoleum". In 1980, the Raiders won Super Bowl XV. Two years later, the Raiders moved to Los Angeles, leaving the A's as the only remaining tenants of Oakland Coliseum. Only days later, Finley agreed to sell the A's to Marvin Davis, who planned to move the A's to Denver. However, city and county officials were not about to lose Oakland's status as a major-league city in its own right, and refused to let the A's out of their lease. Finley was forced to sell the team to the owners of San Francisco-based Levi Strauss & Co.. After the 1986 Major League Baseball season, the original scoreboards were replaced. A new American Sign and Indicator scoreboard and message center was installed behind the left-field bleachers, while the original right-field scoreboard was replaced with a manually operated out-of-town scoreboard. Between the centerfield flagpoles, a new Diamond Vision videoscreen was installed. The 1987 Major League Baseball All-Star Game was held at the stadium. From 1988 to 1990, the venue saw 3 more World Series. In 1989, the Athletics won their 4th Series since moving to Oakland, sweeping the San Francisco Giants in the earthquake-interrupted "Battle of the Bay" Series. The stadium played host to Amnesty International's Human Rights Now! Benefit Concert on September 23, 1988. The show was headlined by Sting and Peter Gabriel and also featured Bruce Springsteen & The E Street Band, Tracy Chapman, Youssou N'Dour, Roy Orbison and Joan Baez. In the 1990s, several major concerts were held, but these were not "Days on the Green", by definition, because they occurred at night. Richard Marx shot the video for "Take This Heart" on the baseball field of the Coliseum. Metallica and Guns N' Roses brought the Guns N' Roses/Metallica Stadium Tour to the Coliseum on September 24, 1992, with Body Count as their opening act. The stadium was the location for the 1994 Disney movie Angels in the Outfield. Although Angel Stadium of Anaheim (known as Anaheim Stadium at the time) was where the Angels actually played, it was damaged in the 1994 Southern California earthquake. Anaheim Stadium was used for views from the outside and aerial views, while the Coliseum was used for interior shots. In July 1995, the Raiders agreed to return to Oakland provided that Oakland Coliseum underwent renovations. In November 1995, those renovations commenced and continued through the next summer until the beginning of the 1996 football season (more info below). The new layout also had the somewhat peculiar effect of creating an inward jog in the outfield fence, in left-center and right-center. There are now three distance markers instead of one, at various points of the power alleys, as indicated in the dimensions grid. The Raiders return also heralded the creation of the "Black Hole", a highly recognizable group of fans who occupy one end zone seating during football games. Along with the since-demolished Atlanta–Fulton County Stadium, the stadium features the unusual configuration of laying the football field on a line from first to third base rather than laying it from home plate to center field, or parallel to one of the foul lines, as with most multipurpose facilities. Thus, a seat behind home plate for baseball is behind the 50-yard line for football. With the Miami Marlins opening their own ballpark in 2012, the stadium became the last remaining venue in the United States that hosts both a Major League Baseball and a National Football League team. On April 2, 2006, the broadcast booth was renamed in honor of the late Bill King, a legendary Bay Area sportscaster who was the play-by-play voice of the A's, Raiders and Warriors for 44 years. On September 8, 2006, the stadium played host to The Gigantour, featuring performances by Megadeth, Lamb of God, Opeth, Arch Enemy, Overkill, Into Eternity, Sanctity and The SmashUp. In November 2007, the San Jose Earthquakes, of Major League Soccer, announced they would be playing their "big draw" games, such as those featuring David Beckham and the Los Angeles Galaxy, at the stadium instead of their then-home Buck Shaw Stadium (capacity roughly over 10,000) in Santa Clara. Since then the Quakes moved to their new home of Avaya Stadium and play their bigger games in nearby Stanford Stadium. Midway through the decade, the stadium established a "no re-entry" policy. Each ticket can only be used once, after which a second ticket must be purchased in order to re-enter the Coliseum. On May 9, 2010, almost 42 years to the day of Catfish Hunter's perfect game, Dallas Braden pitched the 19th perfect game in Major League history at the Coliseum. A commemorative graphic was placed on the baseball outfield wall next to Rickey Henderson's retired number on May 17, their next home game. U2 performed during their 360° Tour on June 7, 2011, with Lenny Kravitz and Moonalice as their opening acts. The show was originally scheduled to take place on June 16, 2010, but was postponed, due to Bono's emergency back surgery. The stadium has hosted an AMA Supercross Championship round since 2011. As part of a new 10-year lease signed by the Athletics with the Oakland–Alameda County Coliseum Authority in 2014, the Oakland Coliseum had a new $10 million scoreboard system (two large outfield scoreboards, 36 feet tall and 145 feet wide, and two ribbon scoreboards) installed for the start of the 2015 MLB season. Also part of the new lease, the Coliseum Authority agreed to pay $1 million a year, with 5% annual increases, into a fund to maintain the stadium. For more than its first three decades (1966–1998) the stadium was known as Oakland–Alameda County Coliseum. In September 1997, UMAX Technologies agreed to acquire the naming rights to the stadium. However, following a dispute, a court decision reinstated the Oakland–Alameda County Coliseum name. In 1998, Network Associates agreed to pay US$5.8 million over 5 years for the naming rights and the stadium became known as Network Associates Coliseum, or, alternately in marketing and media usage as, "the Net". In 2003, Network Associates renewed the contract for an additional five years at a cost of $6 million. In mid-2004, Network Associates was renamed McAfee, restoring its name from before its 1997 merger with Network General, and the stadium was renamed McAfee Coliseum accordingly. In 2008, McAfee was offered a renewal of the naming contract, but it was declined. 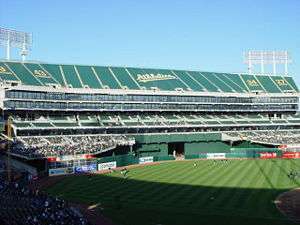 On September 19, 2008, the name reverted to the pre-1997 name of Oakland–Alameda County Coliseum. The stadium retained its original name until April 27, 2011, when it was renamed Overstock.com Coliseum via a 6-year, $7.2 million naming rights deal with online retailer Overstock.com. On June 6, 2011, the Coliseum was renamed O.co Coliseum, after Overstock.com's marketing name. However, due to a contract dispute with the Athletics regarding the Overstock/O.co naming rights deal, the A's referred to the stadium as the Oakland–Alameda County Coliseum in all official team communications and on team websites. On April 2, 2016, Overstock.com opted out of the final year on their naming rights deal, and the stadium was re-branded from O.co Coliseum to The Oakland–Alameda County Coliseum. On August 12, 2005, the A's new owner Lewis Wolff made the A's first official proposal for a new ballpark in Oakland to the Oakland–Alameda County Coliseum Authority. The new stadium would have been located across 66th Avenue from the Coliseum in what is currently an industrial area north of the Coliseum. The park would have held 35,000 fans, making it the smallest park in the major leagues. Plans for the Oakland location fell through in early 2006 when several of the owners of the land proposed for the new ballpark made known their wish not to sell. Throughout 2006, the Athletics continued to search for a ballpark site within their designated territory of Alameda County. Late in 2006, rumors began to circulate regarding a 143-acre (58 ha) parcel of land in Fremont, California being the new site. These rumors were confirmed by the Fremont city council on November 8 of that year. Wolff met with the council that day to present his plan to move the A's to Fremont into a soon to be built ballpark named Cisco Field. Wolff and Cisco Systems conducted a press conference at the San Jose-based headquarters of Cisco Systems on November 14, 2006 to confirm the deal, and showcase some details of the future plan. However, on February 24, 2009, after delays and increased public opposition, the Athletics officially ended their search for a stadium site in Fremont. Speculation was raised as to whether or not the Athletics franchise would remain in Northern California in the long term as a result of the termination of the Cisco Field plan. In 2010, two building sites have become leading candidates for a new Athletics' home: a site in downtown San Jose located near SAP Center (home of the NHL's San Jose Sharks) and a proposed stadium near Jack London Square in Oakland at a site referred to as Victory Court. Under any such replacement proposals, the Oakland Raiders would presumably continue to play football in the Coliseum, although there have been recent proposals for the Raiders to play at Levi's Stadium, the home of the San Francisco 49ers in Santa Clara as well as rumors regarding the Raiders' possible return to Los Angeles. In 2013, the Oakland Raiders have proposed a 50,000-seat stadium in the same spot of their current stadium. It would cost $800 million, with $300 million coming from the Raiders, $200 million coming from the NFL's stadium loan program, and the final $300 million coming from the city. On July 22, 2014, the Athletics signed a 10-year lease to stay in Oakland and at the Coliseum. The deal requires that the team looks into a new stadium, but only in the city limits, making it more difficult for the Raiders taking the stadium down. On July 29, 2014, Raiders owner Mark Davis met with officials with the city of San Antonio to discuss moving the Raiders to the city in time for the 2015 season; they would temporarily play home games at the Alamodome until a new permanent stadium is built. On August 6, 2014, the A's have begun talks with an architect to build a baseball-only stadium at the Coliseum site, according to Wolff. On September 3, 2014, the city of Oakland claimed it had reached a tentative deal to build a new football stadium in Oakland, which would result in the Coliseum being demolished. The claim was met with silence from the Raiders, who continued to explore San Antonio, and opposition from Alameda County. On February 19, 2015, the Raiders and the San Diego Chargers announced plans for a privately financed $1.7 billion stadium that the two teams would build in Carson, California if they were to move to the Los Angeles market. Both teams stated that they would continue to attempt to get stadiums built in their respective cities. On October 5, 2015, the United States Supreme Court rejected San Jose's bid on the Athletics. In January 2016, Mark Davis met with Las Vegas Sands owner Sheldon Adelson about building a domed stadium on the UNLV campus for the Raiders and the UNLV Rebels. In recent years, the Coliseum has been criticized as being one of the "worst stadiums in baseball". Problems cited include the large amount of foul territory and the addition of Mount Davis. The former allows for more foul-outs while the latter has been criticized for "ruining" the ambience of the original configuration. One feature of the 1996 expansion was the addition of over 10,000 seats in the upper deck that now spans the outfield in the baseball configuration. The effect of these new stands, comprising sections 335–355, was to completely enclose the stadium, eliminating the view of the bucolic Oakland hills that had been the stadium's backdrop for 30 years. The stands are very narrow and steeply pitched, bringing the back row of its uppermost tier to a height rarely seen in modern stadiums. 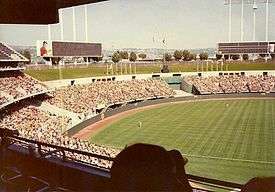 Due to the stands' height and the loss of the Oakland hills view, A's fans have derisively nicknamed the structure "Mount Davis", after late Raiders owner Al Davis. 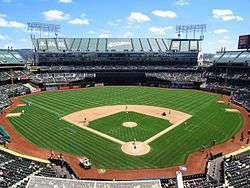 It has been criticized as an area which has made the Oakland Coliseum look ever more like a football stadium, and not at all one for baseball. From 1997 through 2004, the A's left the section open, but it was rarely filled except for fireworks nights and the postseason. The A's did not count the area in the listed capacity for baseball; hence, even though the "official" baseball capacity was 43,662 (48,219 with standing room), the "actual" capacity was 55,945 (approximately 60,000 with standing room). In 2006, the Athletics covered the entire third deck with a tarp, reducing capacity to 34,077—the smallest capacity in the majors. For the 2008 season, Sections 316–318 of the 3rd deck behind home plate were re-opened as the A's introduced their own all-you-can-eat seating area, similar to the right-field bleachers at Dodger Stadium. This has increased the Coliseum's capacity for baseball to 35,067. For the 2009 season, seats were $35 and only sold on a single game basis; all-you-can-eat seating was offered for every game in 2008, but for 2009 the section was only open for weekend games (Friday-Sunday) and all games against the New York Yankees, Boston Red Sox, and San Francisco Giants. For 2010, the A's discontinued all-you-can-eat, instead rebranding the area as the "Value Deck". Prices for these seats have decreased to a starting price of $12 and are sold for every game (individual game prices vary due to the implementation of Dynamic Pricing as of 2012). To help compensate for the loss of all-you-can-eat, the A's have introduced Jumbo-Tickets that have stored stadium credit for food & merchandise ($10 on Plaza Club tickets & $6 for Value Deck tickets). Even if the game is otherwise sold out, the A's will not sell any seats in the area that remains covered except if they make the World Series. The A's say that closing off the upper deck will create a "more intimate environment" for baseball. This has drawn criticism from fans, the Oakland City Council, and sports marketing analysts baffled at owner Lew Wolff's decision, with some stating that this is cover for a possible move to San Jose (see Cisco Field). There are 20,878 seats covered up by the tarp which would otherwise be usable for baseball. However, in the 2013 ALDS, the tarp was removed from the original third deck, though Mount Davis remained covered. The attendance for the first game of the ALDS was 48,401, the highest since 2004. On February 2013, the Oakland Raiders announced that they would cover 11,000 seats in the Mount Davis section with a tarp to avoid blackouts. This reduces capacity to 53,250, by far the smallest in the NFL (league rules require a minimum capacity of 50,000, and no other stadium seats fewer than 61,000). Under NFL rules, the tarps have to stay in place throughout the season, even if the Raiders make the playoffs. However, if the Raiders ever host the AFC Championship Game, the Coliseum can easily be expanded to full capacity; the Arizona Cardinals were allowed to expand University of Phoenix Stadium to 72,000 seats when they hosted the 2008-09 NFC Championship Game. On June 16, 2013 following the game against the Seattle Mariners, the Coliseum experienced a severe sewage backup. This led to pipes leaking out puddles of sewage into the showers, offices, visitor training room and storage areas on the clubhouse level of the stadium, all of which are 3 feet (1 m) below sea level. After the game, the A's and Mariners were forced to share the Oakland Raiders locker room, located on the stadium's second floor. According to Coliseum officials, the stadium's aging plumbing system was overtaxed after a six-game homestand that drew close to baseball capacity crowds totaling 171,756 fans. This was not the first time sewage problems cropped up at the stadium. For instance, on one occasion the Angels complained about E. coli in the visiting team's training room after a backup. Backups occur even when no events are taking place there. For instance, Wolff wanted to go to dinner on June 12, 2013 (while the A's were on the road) at one of the Coliseum's restaurants, only to find out that food service had been halted due to a sewage leak in the kitchen. ↑ "A-to-Z Guide". Oakland Athletics. Retrieved April 3, 2016. 1 2 3 Jones, Carolyn (October 5, 2012). "A's Refuse to Remove Tarp". San Francisco Chronicle. Retrieved October 7, 2012. ↑ "Quick Facts" (PDF). 2015 Oakland Raiders Media Guide. Oakland Raiders. July 27, 2015. Retrieved April 3, 2016. 1 2 "Oakland Raiders Fan Guide". Oakland Raiders. Retrieved May 14, 2016. ↑ "Oakland–Alameda County Coliseum Complex". Engineering News-Record. Peter Griffin-Hill. 179 (2): 13. 1967. Retrieved February 8, 2013. ↑ "Sports" (PDF). Syska Hennessy Group. Retrieved February 8, 2013. ↑ "Official statements concerning the cancellation of gr and prix arizona". Retrieved September 15, 2007. ↑ "Chapter 2 – LWVO Study". WaterfrontAction.org. Retrieved 2013-07-16. ↑ Temko, Allan (July 17, 1996). "Myron Goldsmith -- Noted Architect". sfgate.com. Retrieved 8 March 2016. ↑ Robert Nahas obituary, San Francisco Chronicle, February 26, 2002. Retrieved April 13, 2008. ↑ "Home Run Baptism of New Parks". sabr.org. Retrieved December 30, 2011. ↑ "May 8, 1968 Twins-Athletics box score". Baseball-Reference.com. Retrieved December 26, 2011. ↑ "Oakland Raiders vs. City of Berkeley, 65 Cal. App. 3d 623". 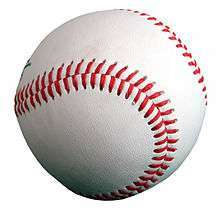 ↑ "April 17, 1979 Seattle Mariners at Oakland Athletics Box Score and Play by Play –". Baseball-Reference.com. April 17, 1979. Retrieved 2013-07-16. ↑ "Report: New stadium to open April 4". ESPN. 30 June 2011. Retrieved 28 May 2014. ↑ Gigantour 2008 Official site Archived January 30, 2009, at the Wayback Machine. ↑ San Jose Earthquakes: Home: FAQ Archived October 9, 2007, at the Wayback Machine. ↑ Woodall, Angela (April 7, 2012). "Oakland Coliseum Still Bears O.co Name". San Jose Mercury News. Retrieved May 27, 2012. ↑ Matier, Phillip; Ross, Andrew (May 12, 2011). "New Name in Oakland Sports: Overstock.com Coliseum". San Francisco Chronicle. Retrieved May 29, 2011. ↑ About Us: History. Oracle Arena and O.co Coliseum official website. SMG (management company). Retrieved September 20, 2011. See also: About SMG (SMG official website. Retrieved September 20, 2011.) and SMG At-a-Glance: Stadiums (SMG official website. Retrieved September 20, 2011.). ↑ "Athletics: No go for O.co". Ballpark Digest. August Publications. April 9, 2012. Retrieved October 6, 2012. ↑ "The Oakland Alameda Coliseum Naming Rights Available". ORACLE Arena & Oakland Alameda Coliseum. April 4, 2016. Retrieved April 10, 2016. Until further notice, the Joint Powers Authority requests that the facility be referred to as 'The Oakland–Alameda County Coliseum', by the media and in all public communications. ↑ Mahbubani, Rhea (April 2, 2016). "Overstock.com Opts out of Naming Rights with O.co Coliseum". KNTV. Retrieved April 3, 2016. The stadium will, until further notice, be known as the Coliseum, Oakland Coliseum or Oakland–Alameda County Coliseum. It remains unclear what permanent name will be picked. ↑ Goll, David (February 24, 2009). "A's Abandon Plans for Fremont Ballpark". Sacramento Business Journal. Bizjournals.com. Retrieved November 15, 2010. ↑ Purdy, Mark (December 3, 2010). "Bud Selig shouldn't bite on Oakland's sketchy pitch for A's". San Jose Mercury News. Retrieved 2013-07-16. ↑ "NFL: 49ers & Raiders Should Share Stadium – NFL – Rumors". FanNation. January 25, 2009. Retrieved November 15, 2010. ↑ 49ers and Raiders to Share Stadium from mvn.com Archived January 19, 2009, at the Wayback Machine. ↑ "Oakland Raiders want new $800M stadium when lease expires after 2013 season". The Oregonian. July 16, 2013. ↑ "New stadium deal for Raiders gives team land, pays off debt". San Francisco Chronicle. September 3, 2014. Retrieved September 3, 2014. ↑ "Las Vegas Sands wants stadium for UNLV, possibly Raiders". Sports Illustrated. 2016-01-29. Retrieved 2016-01-29. ↑ "The 5 Worst Stadiums in All of Major League Baseball". Bleacher Report. January 30, 2011. Retrieved October 6, 2012. ↑ "Inside the Press Box: Oakland: Less Seats, More Filling". Retrieved September 15, 2007. ↑ McCarthy, Michael (March 7, 2008). "All-You-Can-Eat Seats for 2008". USA Today. Retrieved October 6, 2012. ↑ "Jumbo Tickets « A's Ticket Services". Ticketservices.mlblogs.com. January 25, 2010. Retrieved October 6, 2012. ↑ Vic Tafur (2013-02-06). "Raiders will tarp top of Mount Davis". San Francisco Chronicle. Retrieved 2013-07-16. ↑ A's, M's forced into same locker room. ESPN, 2013-06-16. ↑ Slusser, Susan. Raw sewage on clubhouse level creates chaos. San Francisco Chronicle, 2013-06-16. ↑ Steward, Carl. Oakland A's owner Lew Wolff says Coliseum sewage mess not unusual. Oakland Tribune, 2013-06-17. Wikimedia Commons has media related to Oakland-Alameda County Coliseum.